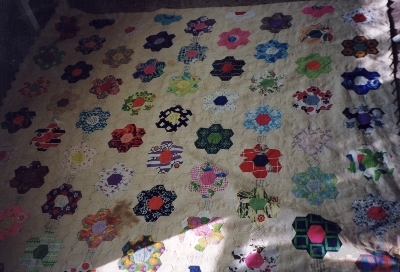 Patchwork quilt made from cotton hexagon patches in the 'grandmother's Flower Garden' pattern, in bright prints and plains, with cream 'paths' made from dress material. Padding is flannel sheeting, and backing is the same cream material as the 'paths'. The centre of the 'flower' patches are autographed with friends' names and dates, as are some 'petals' and cream patches, in black ink. Made by the owner, Hazel Jarmyn, in 1972 in South Australia. "I am Australian Born in a Northern Town Named Booborowrie in my Grand Mother's House and have always been a very keen needle person. I love to sew as well as other needlework, including Tatting and Bobbin lace. I lived on the same Farm until 1979 when we moved to the city in semi retirement and taught all sorts of needlework for 25 years. Foundation member of the Australian Lace guild in Sth Aust, and still like to do all kinds of work."